CRICKET: A WOKING cricketer has admits he is champing at the bit to return to the scene of his greatest sporting moment as he bids to get one over on the Aussies for a second time next month. Lee Stenning is part of a 15-man England Learning Disabilities cricket team that will travel out to Melbourne for four one-day internationals and two T20 matches: the first game getting underway on March 17. It will be the 23-year-old’s third international tour, his last trip seeing England beat Australia twice in as many games out in South Africa at the 2011 Tri-Nations tournament. Stenning also strutted his stuff out in Australia in 2009 where the hosts beat England in the final. And while the defeat was a galling one, former Philip Southcote School pupil Stenning admits he is excited to return to Melbourne and add some more happy memories. “The Melbourne Cricket Ground is so big it’s unbelievable,” he said. “The thing I remember most about it and that I’ll never forget is that I took the best catch I’ve ever taken in my life at the MCG. “I couldn’t believe I’d caught it and everybody else afterwards kept saying they couldn’t believe I’d caught it, it was incredible. “At that time I was opening bowler and the second ball I bowled took a wicket as well so it was just a really good start and I didn’t feel so nervous after that. Stenning’s cricket career began with a stroke of luck when he lived in a house which backed on to Old Woking Cricket Club. One day he decided to go down there to find out what the sport was all about and he’s never looked back since. 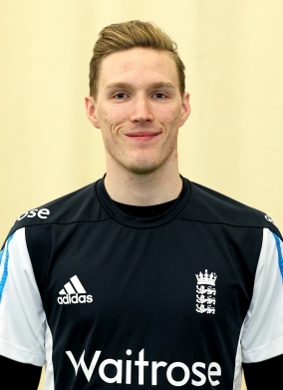 The batsman has played at the club for 13 years now and Stenning admitted that while his cricketing skills have improved dramatically in that time, he has also evolved as a person through playing the sport. “When you grow up with a learning disability you can sometimes feel a bit shy but then playing cricket helps you to grow as a person,” Stenning added. “Sometimes trying to understand can be hard and sometimes the coaches might have to show me a different way of doing something. “I’ve made such a massive jump from my first ever tour. I was 18 when I first went and it was so exciting going to the other side of the world. THE English Cricket Board is an inclusive organisation providing support and a pathway for disability cricket from grassroots to elite. Follow the England Learning Disability squad in Australia at www.ecb.co.uk. To find out how to get involved in Learning Disability cricket contact your local cricket board.